This diary was seriously started in 2017: before that date my notes are few. The swamp was bequeathed to the parish council. Work has been done on it over winter. Now if you were going to manage a place called Pauline's Swamp what is the first thing you would do? Improve the drainage? Yet that is exactly what has been done! Management by ignorance, I think. The lower pond has been (re)connected to the drainage ditch, such that it is (even now, in early spring) almost unable to hold any water. The top pond has had an overflow added, so you cannot walk around it! An overflow here is particularly pointless as the pond is ground-water fed and I can see no circumstances under which the water level can ever get high enough to overflow the old ground level. Anyway - it's a swamp! Sunday 15th: During spring and summer sheep were allowed into the site, to graze. The site has ben grazed by ponies and geese, never before by sheep. In early July, 2010 the site contained some 200 sheep (or more - try counting sheep!). 200 sheep in a 1.5 hectare area, for 3 weeks... The swamp vegetation was razed to the ground. Even the nettles and thistles were devastated. I have some photos taken just after the sheep were removed which show the devastation. The main pond is very low and as a result is very smelly (hydrogen sulphide is noticeable when it is stirred up). This probably accounts for the poor growth of frog-bit I had introduced earlier. The second pond is now totally dry. Thursday 8th: Thursday the 8th of September, 2011. Sheep are back in: around 50 at this time. East Cambridgeshire District County Wildlife Sites Register 2005 said the site was grazed by geese and donkeys which were kept there permanently. Sheep have very different grazing patterns and occasional grazing by a too-large flock of sheep will change the flora very significantly. At the open day: The pond-dippers reportedly caught two Crayfish. Unfortunately no further action was taken at that time. Appropriate action had to wait until March 2017. 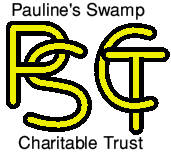 The care of the Swamp has been taken over by a group of trustees. Ivy is being cleared from trees, the stream is being cleared of debris and areas of sedge and long grasses have been reduced. The field has been mowed, and the area at the back cleared of undergrowth to form a proper path. Last autumn I broadcast some Ramsons seeds in the wooded area. There are now baby ramsons seedlings appearing, if you look hard enough. In flower this month are Marsh Marigolds, Lesser celandine and cowslips. All are splendid. Monday 20th: The occasional pond has had a leak since the drain was cleared way back about 2008. Paul Hawes had been attempting to prevent this pond leakage using clay. I have now identified the source of this leak, using Fluorescein. Tuesday 21th: The leak from the occasional pond has now been successfully stopped with clay. Water level is rising. Wednesday 22nd: This was a working day: a digger had been hired and the stream bed was scraped and two weirs added to form two more occasional ponds. Old dead sedge was cut down. This was also the day two men from the Environment Agency visited to investigate the crayfish. Four people including myself and the men from the agency spent about 2 hours netting for crayfish, with no luck. Three traps were laid by the agency men and one (with smeller mesh) by myself, and left for a couple of days. Friday 24th: Environment agency traps removed. The crayfish hunt has so far proved negative. Thursday 6th Ditch dug (by Paul Hawes, on my suggestion) to divert the stream into the main pond. This should keep the water level higher and the pond in better condition for the crayfish. Friday 7th Stream flow is low and is running into the main pond. Consequently the occasional ponds are now all below maximum. Good Friday 14th Stream flow had been blocked from the pond to divert flow to fill occasional ponds. Today it is again flowing into pond. Found Elodea canadensis in main pond. Introduced more Ceratophyllum submersum & 2 Stratiodes aloides. 15th Main pond level has risen well over night. Easter Sunday 16th Pond is very nearly full. Easter Monday 17th The main pond is now full and what little water still flows is filling the other ponds. The pond filling has been slow because the filing ditch has been intermittently blocked off to keep the occasional pond water levels reasonable. Tuesday 18th The main pond is crystal clear and at a level about 25mm below the staging, in much better condition to allow water plants to thrive. I have again been cutting the ivy which heavily infests the trees on the old railway line, and those in the grey poplar grove. Many of the trees were in danger of falling because of the ivy - some have indeed already fallen. Water flow is very low, but a trickle is flowing down into the occasional pond. Low flow could be the dry weather - but we did notice a pump in the building site running over the weekend. Although no pump is audible there is noticeable water flow from the building site into the industrial estate ditch. Friday 21st Water flow has all but stopped so that only the main pond is full. The industrial estate ditch is covered with apple blossom which seems to show zero surface flow from the housing estate. Sunday 23rd Water flow is low and is split fairly evenly - a noticeable amount flows into the pond to maintain the level and the rest keeps the stream wet, but is not sufficient to maintain pond levels at maximum. There is detectable ground water flow from the new housing estate. Saturday 28thWith water still flowing in, the main pond remains in much better condition than it has been before. The remaining water flow in the stream has not been enough to keep the bottom occasional pond fully topped up, but the recent rain has accomplished this. Tuesday 2nd The meadow buttercups are starting to open. Wednesday 3rdA small meeting was held in the swamp to discuss management strategy. We also walked to Burwell Spring and discussed what could be done there. Newt traps were laid overnight ponds and the two scrapes, as well as in the feeder ponds. The search is really for Great Crested Newts (there are none!). The lower pond yielded 2 male smooth newts. The main catch was in the main pond -11 male and 3 female smooth newts. As well as smooth newts, five 9-spined sticklebacks (Pungitius pungitius) were caught. These are less common than the 3 spined stickleback. Permission was also obtained to trap the Feeder pond, where 3 male and 1 female smooth newts were caught. Saturday 6th A maintenance day. Mainly deciding on maintenance strategy. I transplanted some of the as yet unidentified water crowfoot from the bottom pond into the main pond. Sunday 7th Buttercups are starting to flower - but possibly are not as plentiful as in 3013 (see photos in the gallery). However full flower is in June. Water flow is low and the bottom pond is starting to dry out. Wednesday 10th More trapping of newts tonight. Sunday 14th Bottom pond is now dry. Common Mouse-ear (Cerastium fontanum) and Meadow Buttercup (Ranunculus acris) are in flower. Tuesday 16th Water flow is now just a trickle: min pond level is slightly lower, the stream bed is wet to the top scrape but the bottom scrape and occasional pond are dry. The previously unidentified water crowfoot in the occasional pond has, however, started to flower. It is the Thread-leaved Water Crowfoot (Ranunculus trichophyllus) which is not uncommon in the East of England and likes shallow water and temporary pools. Friday 19th Last night newt traps were laid - without catching any! Thursday was very wet, as was Thursday night so this morning there were puddles in the swamp, the occasional pond was full and overflowing fast, There was also water flow from the feeder pond to the main pond and to the stream. The meadow buttercups (Ranunculus acris) and common mouse-ear (Cerastium fontanum) are in full flower. Crowfoot (Ranunculus trichophyllus) and fennel pondweed (Potamogeton pectinatus) introduced into the main pond have been uprooted - probably by ducks - but seem to have been growing. They have been replanted. 1st (Thursday) Water flow has stopped. Main pond level has fallen about 100mm. Both scrapes and occasional pond have very little water present. The conduit under the railway embankment is still wet. There is a patch of new Common Bird's-Foot trefoil (Lotus corniculatus) - a plant not previously recorded here but not uncommon in the area. 2nd (Friday) Last night was the 4th (and final) night for newt sampling. Several smooth newts were caught. Late-light lamping even disclosed three in the very small puddle in the occasional pond. The stream bed exit from the railway embankment now is mud with no free water. The Fennel pondweed (Potamogeton pectinatus) introduced in April appears to be establishing. The Creeping cinquefoil (Potentilla reptans) is in flower and very pretty. 6th (Tuesday) Todays rain has made the place swampy again. There was not enough rain to cause the stream to flow so the main pond (which drains little surface water) has not risen but the ditch and 3 temporary ponds are all now wet whereas before the rain they were all dry. The rain has encouraged some fungi to grow in the grey poplar grove. 7th (Wednesday) There was enough rain to cause some water flow from the feeder pond to top up the main pond. Seems it takes 24 hours to take effect. I do not know where the aquifer gets its water from. 21st (Wednesday) James Moss provided figures for the rainfall (in mm.) for Cambridge weather station for the period August 2016 to May 2017. We have a significant deficit in rainfall which has been present since late summer last year. It is then no wonder that the pond water level is now extremely low. 22nd (Thursday)Black Knapweed is in flower, and Marsh bedstraw flowers twinkle like little stars, scattered through the grasses. 24th (Saturday) This morning trustees and volunteers planted 4 Ash trees along the perimeter, several buddleia around the barn and several walnut trees. I did not help - Ash is already the dominant tree and more are not needed. Buddleia and Walnut are not British native trees - there are already two squirrel-planted walnut trees! This afternoon water was flowing from the new building site, despite there having been no rain for many days (last rain on June 6th). Monday 27 &: Tuesday 28th Heavy rain started about 10:30 and continued overnight. In the morning the occasional pond (which has a large catchment area) was full and the grass swampy. No water was flowing from the feeder pond but rain that drains into the stream at the top of the site can now run into the pond so its level has risen by, perhaps, 100mm or so. 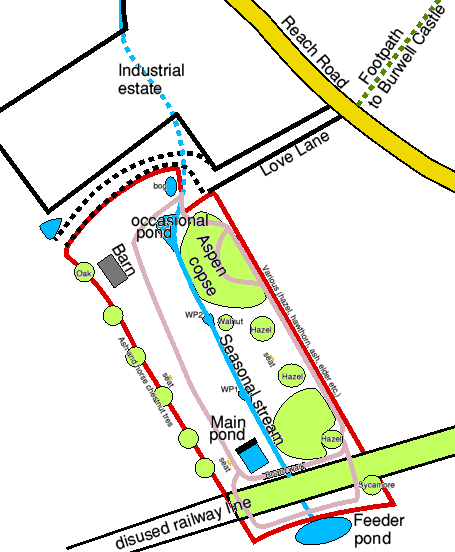 Before the ditches were dug (April 6th) the pond's catchment area was more or less its own area. By 4p.m. water had started to flow from the feeder pond so water level was even higher. Again, there seems to be about 24 hours delay between rain and the water table rising to overflow the feeder pond - see June 7th. Much of the vegetation, especially the tall grasses in the wet areas, are beaten down by the heavy rain. Tuesay 4thWater has completely ceased flowing: culvert under railway is dry. Main pond level is good. occasional pond level has dropped significantly. The Soft Hornwort (Ceratophylum submersum) introduced April 2nd has grown, but algae and silt has dragged it to the bottom so it has not done as well as could be expected. Clearly pond-dipping and dogs swimming have an adverse effect on the plants that can succeed here. It has been cleaned up and sub-divided. Friday 7th The occasional pond is now empty, though the mud is still wet. Sunday 23rd Anglia Water visited and confirmed that the flow from the building site is mains water, not ground water. This flow has been going on for at least a month - see entry for June 24th. Overnight and today it has been raining. A lot of fungi (Coprinus plicatilis) have appeared on the track adjacent to the occasional pond. As yet there is not enough water to pool in the occasional pond but the main pond level has risen slightly. Many flowers are near the end of their flowering. Black knapweed (Centaurea nigra) is still splendid (and there is one white plant) and there is a patch af late Lady's bedstraw (Galium verum) still in flower. Great hairy willowherb (Epilobium hirsutum) is notable. Wild carrots (Daucus carota) are proliferating this year. Meadowsweet (Filipendula ulmaria) is near its end. Sunday 30th Heavy rain last night was enough to cause some small level of water in the Occasional Pond. The main pond level; has risen perhaps 30mm. As this collects little run-off from the surface, there must be a corresponding rise in the ground water. The wetness has encouraged quite a lot of Fungi to fruit. Wednesday 8th Heavy rain last night and today has raised the main pond level by, perhaps, 0mm. The occasional pond, which collects much more surface run-off, has about 75mm of water. Visiting in the evening there was a characteristic plop as the water vole entered the water, leaving a wave of bubbles as it dove beneath the water lily. Sunday 13th The water vole appears to have left: the channel in the Chara foetida is growing over, the water plantain, which had been chomped, is growing new flower spikes and there is now no trace of the latrine. Nor did a careful paddle around the pond edge reveal any other latrine site. Notices for the open day have been put up - a mere 3 weeks before the event. Also put up was my own notice about swamp management, which I had presented to the last meeting, on July 20th, over 3 weeks ago. Also today, I laid three traps for the crayfish, which will be left in place for several days. Plants still in flower are few - most noticeable is the common hedge bindweed. Saturday 19th The meadow area of the swamp was mown today. Sunday 20th The crayfish traps that were first layed last sunday were removed today: they have been in for a whole week and have caught only sticklebacks, tadpoles, various water snails and a couple of newts. Sunday 3rd This was the Open Day: there are photos and information on Pauline's Swamp Open Day 2017 on a separate page. Saturday 9th For the Open Day, some of the Stonewort (Chara foetida) had been cleared and piled at the edge of the water - as it should, to allow creatures to crawl back into the pond. Today I removed all of this so that it would not rot and reduce the water quality when the level rises again. Currently the water level is as low as I have ever seen it. Several fungi are evident: Fairies Bonnets (Coprinus disseminatus) is evident in the grey poplar grove. coprinus atramentarius is growing in the base of one grey poplar and coprinus lagopus is growing on the track beside the occasional pond. Sunday 10th Paul Hawes has bought 50gm of Yellow Rattle (Rhianthus minor) seed. Today we planted it: four patches of about 3ft x 2ft were strimmed down to near bare earth, then raked. Seed was spear over the patches and then trodden down. The rest of the seed was spread over the many mole hills that are present in the swamp. Recent rain has raised the pond water level by about 80mm (3") but level is still low. So I donned waders and entered the pond. With help from Paul Hawes the pink water lily was removed - nobody knows who planted it there but it was clearly quite deliberate as it was in a basket from which it had escaped. Paul's original lily was also reduced in size. We also removed the white water lily in the corner - a bit more difficult as, although it was smaller, it was rooted in very firm soil rather than the loose silty mud that covers the rest of the pond bottom. I had originally intended to remove both ornamental lilies and move this native white lily into the centre, but removing one large lily was such a task that I relented, and as the white water lily was in many small pieces I considered the extra work involved to be not worth the benefit. Many sticks were found on the bottom of the pond and removed. When there is ice on the pond certain of the village youths cannot resist the urge to throw sticks to break the ice. Many of these have sunk over the years. Paul also strimmed some of the black sedge in the occasional pond. But a strimmer is not the beest tool as long sedge tends to wind around the strimmer's head. Friday 13th Paul Hawes used a hedge trimmer to cut a good area of black sedge from the occasional pond while carried it my the armful to the grass heap in the north corner of the area. We then raked out much of the old thatch. We also cleared nettles and brambles from the ditch that carries the overflow from this pond. There are several species of water plants apparent, which will now have a chance to flourish. These include watercress, fools watercress, a water crowfoot, water mint. See the plants list for more details. Saturday 21st Today I put a small fringed water lily (Nymphoides peltata) in the main pond. Sunday 5th Today was a work day: much of the area of meadowsweet and sedge was mown. A gang og helpers from the Trust, Kingfisher's Bridge and others then raked the mowing up for removal to a waste pile. This management will slowly deplete fertility which will help wild flowers to flourish by reducing competition from the grasses. The areas mown were to the North-east of the grey poplar copse, the stream bed and a parallel section. To avoid species loss different areas will be mown/left unmown in different years. The month started out without much rain but gradually got wetter. Wednesday 20th The fallen grey poplar trees, one of which had been partially cut up to provide logs for seating, have been completely cut up and removed. We suspect to be used for firewood. Whether this is official, or theft, I do not know. Wednesday 27th The lower pond has been slowly filling and today was the first day it actually started to overflow. Thursday 28th The stream started to flow today. It is noticeable that the water level in the feeder pond is almost always higher than in the main pond - the spring level that feed the main pond is clearly higher than groundwater level in the Swamp.. The ditch to channel some flow into the main pond has become a bit overgrown so it has been a bit cleared. It seems senseless to have a pond not full when it can be. Saturday 30th Having cleared the ditch that allows stream water in to the main pond, the main pond is now full and water is flowing out of it back into the stream. Page first published Monday the 17th of April, 2017.